Initially the plan was to just accompany mum to get a steel rack for her pots. Somehow the stroller (a used one someone gave us) got stuck so we planned on getting a new stroller for Sofia as well. Nearly 4 months of not going to the mall, I feel so awkward! Is it because now I'm carrying a baby or what? I feel like everyone's watching me and Sofia. Apahal pandang-pandang. Seriously, rasa sangat janggal. And that, was on a Wednesday, weekdays yang tak ramai orang pun. I had to carry Sofia all the way until we got her a stroller. Going up the escalator while holding Sofia close to my chest make me feel so gayat I can fell my legs shaking. Legs spread apart to maintain balance. Siapa yang naik lif mengangkang? Hahaha... Whatever, janji selamat. Oh by the way, we didn't go straight to buy a stroller. Singgah Toys R Us dulu haa... I am one excited mother. I showed Sofia a lot of toys; pushing the buttons and see how she reacted. She was wide awake and so alert, eyes wide open, gleaming at all the colours. Lucky thing my brother was kind enough to carry her for me. Or maybe he was just annoyed at me telling him to push every single button on every single toy to see Sofia's reaction... You choose the toy, let me hold Sofia. We got her a Crinkle 'n Clack Caterpillar toy. The green leaf will make a crinkle sound when you grasp it. Then we headed to Parkson to get her a stroller. A few months ago when I was pregnant, Iz and I went to Parkson just to survey on the price range. I remembered telling him, "Wah banyak kan kita dapat jimat, tak payah beli baru" Hahaha. Yeah right. Should have tried it out first. Sofia dah nak masuk 4 bulan baru sibuk nak cuba... Dah kelam kabut kena cari. There were so many varieties to choose from! I decided to get Sofia a two way facing stroller. Just because I thought Sofia might be more interested to look at me than the stores. Hahah. But really, I thought Sofia might be more comfortable having eye-contact with me for now. As she grew older, we can let her face forward. "Sekejap pun kalau dia terberak terkencing camana?!" Changed her diaper and gave her milk in front of an elevator; mothers' room is just around there but mum being mum, the no frills mum, "Tak payah ngada-ngada sini je dah". I was just on the way to the room, pushing Sofia. Okay, then. 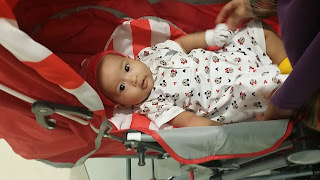 Sofia seemed calm in the stroller; all the time looking at me (duh), smiling, and babbling, so we continued shopping for my brother's stuff and mum's new shoes (masa ni pula nak tercabut... Macam tau-tau je). Until she fell asleep. We had lunch (still sleeping) and then went to get myself a new pair of shoes. Brother waited outside with the stroller but soon came to us; Sofia dah mula bising. Mum had to carry her while I tried on the shoes. Good social skills, this kid. Or maybe because she hasn't developed strangers anxiety yet. She smiled and babbled at the Chinese store supervisor. Leave to the parking lot straight after and nursed Sofia in the car. She was soon fast asleep until we reached home. In the end, mum didn't get her steel rack pun. Terima kasihla mek... Tahniah juga sebab berjaya tak beli, macamana bawa anak jalan-jalan? Bab stroller. Fiza tak beli, sebab kakak fiza bagi. Anak2 dia dah besar panjang semua. Tapi, hanya sekali ja fiza guna. Bila anak dah pandai jalan, dia tak ingin pun nak duduk2 ni. Dia nak explore semua benda bila kat luar rumah. Heh iyela selalu juga assume tak payah bekalkan apa sangat. I pub assume kejap je takpayah la apa-apa pun.